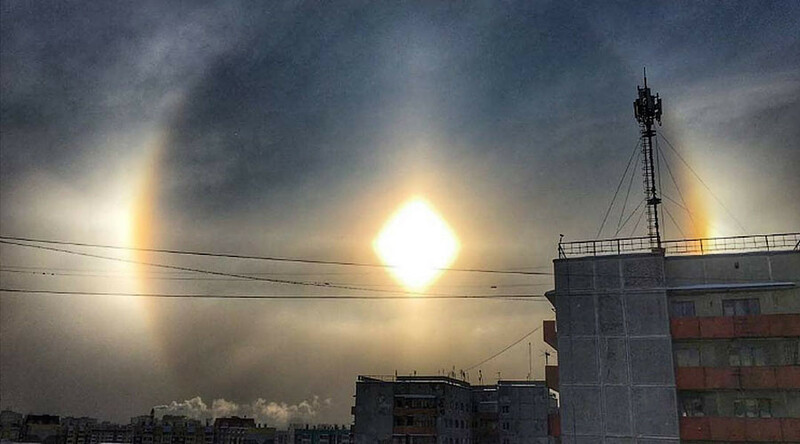 Internet users from Murmansk, Tyumen, and Chelyabinsk are uploading photos of a shining circle around the sun – a natural phenomenon known as the halo effect, especially stunning in the dim northern skies. Sometimes called winter rainbows, the halo is created by ice crystals which cause refraction, just as rainbows are caused by water droplets. The symmetrical patches of light, tinged with red on the inside, are called mock suns, parhelia, or sundogs. Halos can have many forms, ranging from colored or white rings to arcs and spots in the sky. Circular halos, light pillars, and the above-mentioned sundogs are among the better-known forms of the phenomenon. These photos were uploaded from the city of Tyumen, where the temperature is around -20C. Here’s an image from Russia’s northern port city of Murmansk capturing the same unusual natural happening in the sky. Вы же всегда хотели узнать, как выглядит #гало, да? A crisp view from Salekhard, the town closest to the polar circle. According to northern Russian tradition, these sightings are believed to bring colder weather. Although rare, the phenomenon graces Russia’s north with its presence fairly regularly.